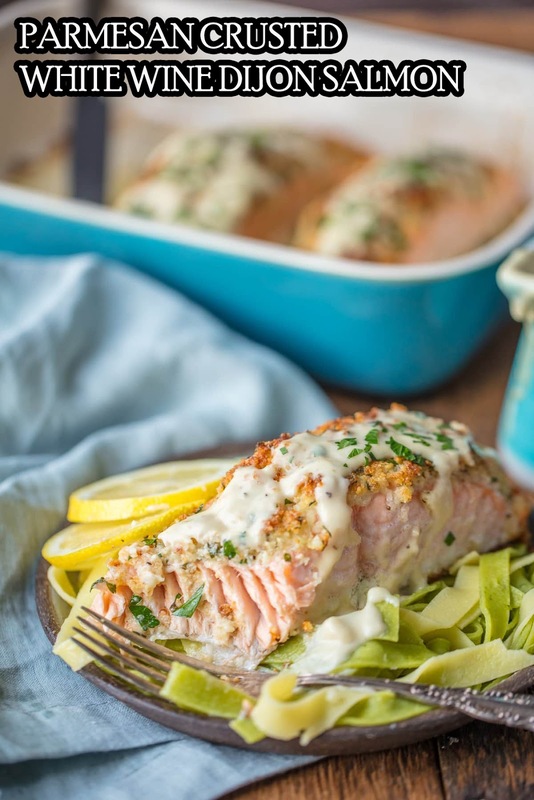 PARMESAN CRUSTED SALMON is our very favorite way to enjoy seafood! I love making salmon because it's delicious AND good for you. This White Wine Dijon Salmon is coated with a crispy garlic Parmesan crust and drenched in an amazing white wine sauce. Preheat oven to 400 degrees F. Líne a large bakíng sheet wíth foíl or parchment paper. Place the salmon fílet on the bakíng sheet. ín a small bowl, combíne breadcrumbs, Parmesan, garlíc, salt, pepper and herbs. Míx well. Add melted butter and míx. 0 Response to "PARMESAN CRUSTED WHITE WINE DIJON SALMON RECIPES"